Designing a custom interface from scratch is not a simple task. Even professional designers browse other interfaces for inspiration and idea generation. But it can be tough knowing where to look for this kind of inspiration, especially since the web is saturated with hundreds of design resources. In this post I’d like to share a handful of resources to find free UI and UX design ideas online. These sites are all free to browse and frequently updated with new ideas. Whether you’re designing for mobile apps or crafting sites with website builders there’s no shortage of design inspiration. You just have to know where to look to find the best stuff. Whenever starting a new project one of my first destinations is a related inspiration gallery. These galleries curate designs and organize them based on subject matter, colors, design features, and other similar properties. For website ideas I prefer siteInspire just for the humongous collection of 4000+ different websites in their gallery. You can search by subject matter, design styles, or just browse the whole collection page by page. But Unmatched Style is another decent choice. Mobile designers have a little more to choose from because there are so many design mockups and quality mobile apps out there. The difference is that most mobile apps follow design patterns rather than specific interface features. These patterns are easy to repeat once you understand how they work. But you really need to study mobile app design to put together working ideas. 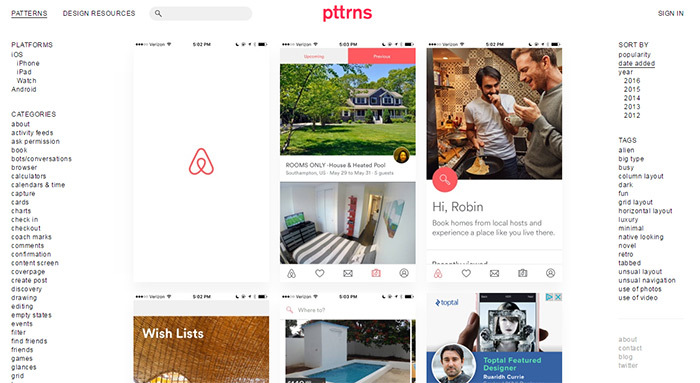 Pttrns and Mobile Patterns are two websites both made to serve mobile designers. They showcase quality mobile app design patterns that you can repeat and restyle for your own applications. Many of these patterns actually come from real applications showing designs from prominent app screens. This offers inspiration that’s not only beautiful but also feasible to re-create since an existing app already uses the interface in real life. UI Parade is a similar concept but with spec mockups rather than real applications. All of these mobile design galleries feature quality interface patterns, color schemes, typographic choices, and icon designs to help you build usable interfaces of your own. They can even influence website layouts in instances where the design patterns can be device-agnostic. Another personal favorite of mine is UI Garage which catalogs mobile-specific interfaces and design patterns all in one place. These galleries go to great lengths to help you search by category and UI element like signup forms, empty state pages, launch screens, and checkout forms(among dozens of other options). UX Archive is somewhat unique in that it presents real application flows from start to finish. So you’re not just looking at the designs. You’re looking at the entire user experience flow moving from the first page to the last page. This may not be as useful to interface designers, but UX designers & animators will really appreciate the storyboard-style layout of this gallery. Another alternative is to peg down a niche specific inspiration gallery suited to your needs. There are so many great galleries on the web and new ones launch every day. Here’s a handful of specific niche sites you might enjoy that target inspiration for unique digital interfaces. For more specific design galleries I’ll browse through blogs for showcases and hand-curated collections. These galleries get a lot more specific with ideas like feature film websites and targeted small business websites. I’m always looking for blogs that actually have a unique inspiration category for organizing their galleries. You can find this on many big design blogs like Speckyboy, WhatPixel, Line25 and Hongkiat. There is no right or wrong way so sort through these galleries. Some people might browse the category page by page, others might prefer to nitpick through inspiration galleries based on specific needs. There’s almost no limit to how many custom inspiration galleries you’ll find on blogs. The most useful galleries are categorized by certain design properties you’re looking for. These can include small business designs or specific colors or certain types of layouts(like minimalist or grunge or retro). Even SpyreStudios has its own inspiration tag for browsing through websites and design galleries. And it’s likely that all your favorite design blogs have their own inspiration categories too. You’ve just gotta find them and bookmark them for future reference. Here are some honorable mentions for inspiration categories on other design blogs. I’m surprised how few design communities are online in today’s age. While there aren’t a large number of these communities, the ones that are online really pack a punch. 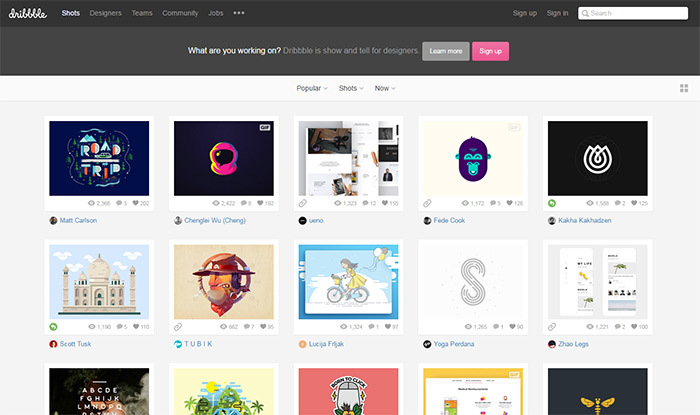 Dribbble is the most populated and offers the most volume when it comes to design inspiration. Users upload new content every single day and there’s likely over a million unique shots of mobile apps, website layouts, and other product/illustration designs. I also like Behance although it’s admittedly lower quality than Dribbble. Behance is a completely free network while Dribbble is invite-only so they both have different content requirements for publishing. However they’re both fantastic options and if you’re looking for inspiration you should consider browsing through both. Sometimes I’ll also check out the Awwwards galleries since many of them are hand-curated by a combination of user votes and editorial votes. Awwwards has its own blog with inspiration galleries there too. But the site’s main purpose is to showcase the best designs from around the web. The problem with Awwwards is that many of the designs tend to “push the limits” of traditional interface concepts. This means you probably won’t find classic layouts in the site, but rather examples of experimental or avant garde designs. 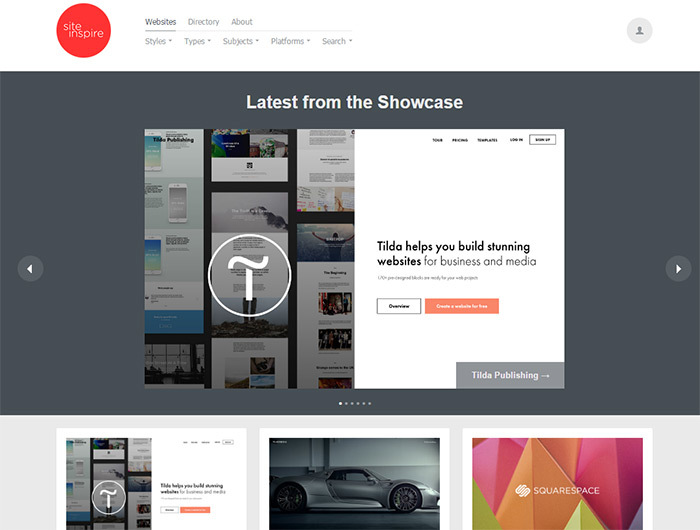 It’s still one of the best communities for design inspiration so it belongs in this list. Just be wary of how many ideas you borrow since the designs can be rather intense. 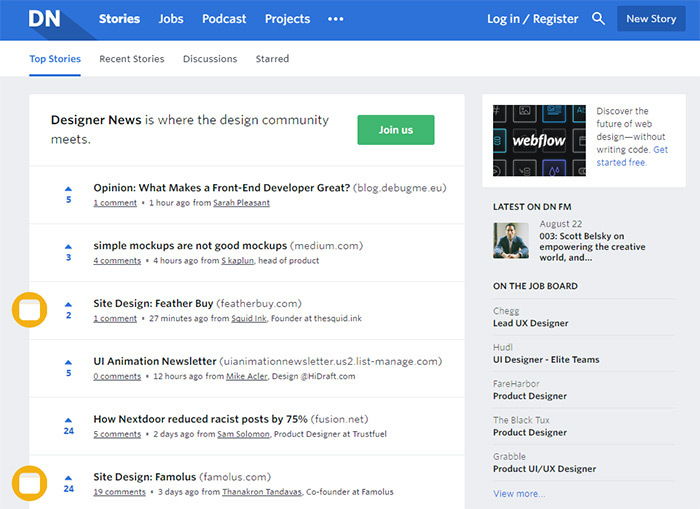 And lastly there’s the newer social news community of Designer News. This community is 100% powered by user voting so the links end up on the front page based on popularity of the community. Many of the posts do relate to product launches and breaking news. But often times you’ll find a post with the prefix “Site Design”. This means it’s a post showcasing a specific design(or redesign) of a website. I’m a huge fan of Designer News and I think the post quality is incredible. If you’ve never checked it out before then I’d give it a very high recommendation. Very few social networks offer prominent inspirational content. But the few that do are fantastic. Twitter and Facebook are big networks but they’re made for communication and branding rather than inspiration. One great choice is Instagram where you can actually search via their native web API. For example you can search the tag wireframes to find wireframe sketches posted to Instagram. 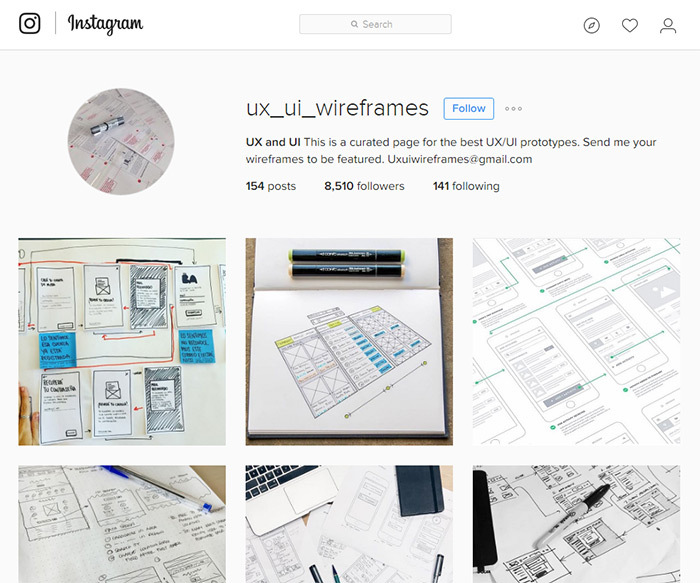 In that process you might stumble onto a cool wireframes IG account which specializes in posting wireframe inspiration. This is the type of stuff you won’t find in Google images and Instagram makes the perfect network for photo curation. Another social site I adore is Pinterest. The userbase tends to be shoppers and “mood board” type users but there’s a great deal of web design inspiration too. In fact, a search for web design shows hundreds of custom boards dedicated to website design inspiration. The same can be said for UI/UX design, mobile app design, icon design, and basically every other form of digital design. Pinterest is heavily trafficked and mostly full of people who love beautiful things. If you’ve never used Pinterest for design inspiration it can be rather hectic at first. But once you learn how to search and find what you’re looking for it can turn into one of your favorite tools. The last site I want to recommend is Tumblr. I haven’t found too many social profiles on here that curate beautiful design, but there are some and they do the job well. 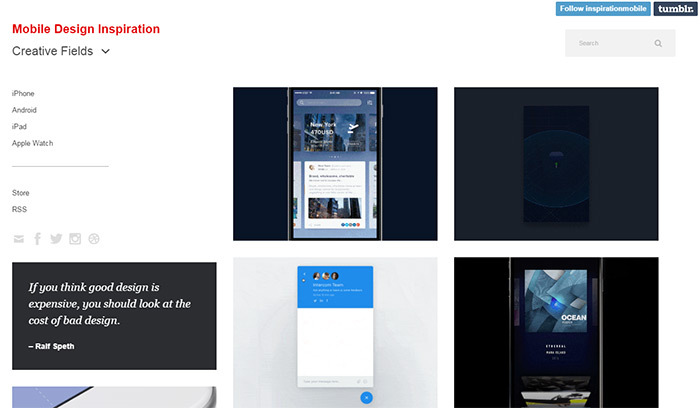 Mobile Design Inspiration is a Tumblr account dedicated to UI/UX mockups and custom animations. It’s updated regularly with Android/iOS inspiration sourced from all over the web. Tumblr blogs like this one can save you a lot of time scouring Dribbble and Behance since it curates all these resources in one location. And if you have the time you might even setup your own social channels to share inspiration ideas for others. The design community is made up of great people who are willing to dedicate themselves to the craft. And it’s this dedication that makes finding quality inspiration so easy and fun. All of these websites should get you started on the right path to finding quality interface design inspiration. Over time you’ll learn which sites offer the best results for your projects and you’ll end up going there first. But there is no wrong way to find inspiration so just dig in and go to town! And don’t forget that you always have Google, by your side which may just be the #1 inspiration resource finder on the web.